Inspired by his own powerful experiences during the Civil Rights movement in the 1960s and other social movements in the '70s, '80s, and '90s, Stephan Schwartz spent 16 years researching successful social transformations, uncovering the science and the patterns behind them all. He found that there are three ways to create social change. The first is the advancement of technology and science. The second--change compelled by physical power--is almost always coercive and violent and, for those reasons, not long lasting. The third avenue of change he discovered--the most successful and enduring--is one brought about by something so subtle it is often not taken seriously: small individual choices based on integrity and shared intention. 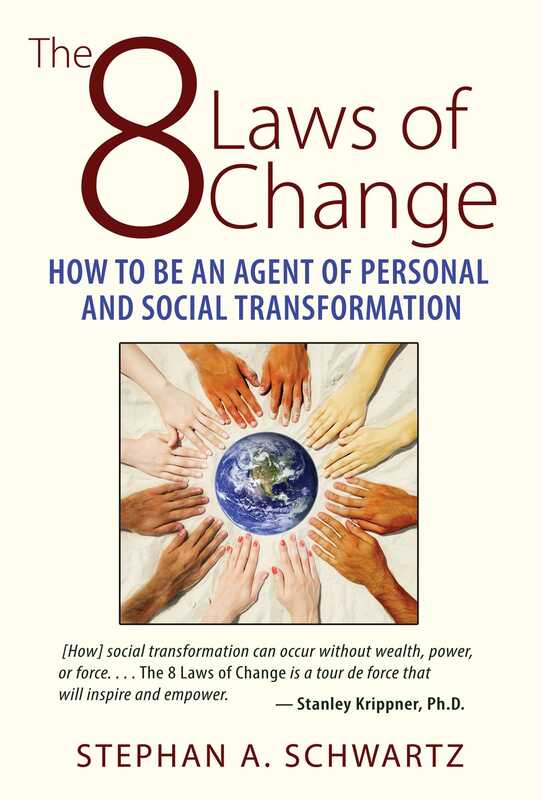 Revealing how the dynamics of change are learnable, Schwartz explains the 8 laws of individual and social behavior that can enable any person or small group--even ordinary people without great wealth, official position, or physical power--to bend the arc of history and create successful lasting transformation. He shares the stories of individuals who have actually changed history, such as Martin Luther King Jr., Benjamin Franklin, Mother Teresa, and Mahatma Gandhi, detailing how they implemented the strategies and tactics of the 8 laws to achieve their success. The author explores research in the fields of medicine, neuroscience, biology, and quantum physics to reveal the science of how these laws of change work. He explains why compassionate and life-affirming changes have the most enduring impact and shows how each of the 8 laws cultivates a sense of "beingness" in the individual, empowering your integrity and connecting you to something greater than yourself--the key to lasting change on the personal, societal, and global levels. My friend Sheila, who was a tough-minded New York career newspaperwoman turned magazine writer, prided herself on her cynical view on life and her ability to not be taken in. One day she got an assignment to do a story on Mother Teresa, and she welcomed the opportunity. She saw the piece as an exposé. “I thought she was a fraud, a genius at public relations maybe, but I disliked her conservative theology, which I thought demeaned women, and I found her constant involvement with the rich and famous very suspect.” She explained to me how she arranged to join Mother Teresa and spend more than a week traveling with her and watching her at one of her hospices. No one else in modern history has understood and articulated the approach of beingness better than Mahatma Gandhi. Just before he was assassinated, a reporter had the opportunity to interview Gandhi and asked this question: How did you force the British to leave India? Britain had dominated the subcontinent for more than a century. Gandhi had no army, no money to speak of, no official position, none of the trappings that normally confer authority and power. Yet he had made the most powerful nation of his day leave its most valuable colonial possession, without a war. Gandhi answered the question in this way. It perfectly articulates the power of beingness. “It was not what we did that mattered,” he told the reporter,“although that mattered. “It was not what we said that mattered,” he added, “although that mattered. Positive life-affirming beingness is core to a social transformation strategy based on nonviolence. But I want to be clear that an intensity of beingness need not be positive and life affirming. There is a shadow side to this, and it is important to understand and acknowledge its reality. Let me take Gandhi’s antipode. Historians have debated for centuries what forces produce what they call “The Great Man,” leaders like Napoleon who arise from the mass, and with astonishing rapidity achieve positions of unchallenged power. How does a misfit like Hitler become the leader at a time of high civilization? I think the answer is beingness. Carl Jung said to appreciate how Hitler came to power, it was necessary to realize that “Hitler did not lead the German people, Hitler was the German people”--the personification of a popular critical consensus. The transformational power of beingness begins with an individual’s choices. But when that individual beingness is a peculiarly sensitive resonator, social change occurs whether for good or ill. Gandhi represents the life-affirming polarity that resulted in a people gaining their independence without war. Hitler personified and gave voice to the dark pool of anger and humiliation felt by that portion of the human race self-defined as German. Hitler and Gandhi are extreme examples of the power of individual beingness, and what happens when intensely held individual beingness resonates with a collective gestalt. I am using them precisely because they are so extreme and because they illustrate very clearly that beingness is powerful--whether positive or negative. As Anthropologist Margaret Mead so famously said, “Never doubt that a small group of thoughtful, committed citizens can change the world; indeed, it’s the only thing that ever has.” Ultimately it gets down to individual choice. Everything starts with one person holding an intention and making decisions expressing that intention. As their beingness changes even the most unlikely people can become enormously powerful. This process constitutes one of the least understood social forces in our world. The obvious thing they have in common is that they were all by design nonviolent; movements created mostly by people who did not command power as it is usually understood. Dig deeper and underneath the obvious, and independent of political considerations, there beats a deeper drum, one that is rarely recognized. The most fundamental thing all these changes had in common was that they occurred as the result of a transformation of self in common intention with others. Beingness. The strategy of violence values immediacy and cares little for collateral damage. It is also vulnerable to violent change itself. The beingness strategy works at a deeper level; more slowly, because it changes people’s hearts. As the intention is expressed throughout the day in unnumbered small mundane individual choices, it produces a change in the worldview of the culture and with the minimum amount of violence and hurt. Scientist, futurist, and award-winning author Stephan A. Schwartz is a columnist for the journal Explore and editor of the daily web publication Schwartzreport.net, where he covers trends that are affecting the future. He also writes regularly for The Huffington Post. His academic and research appointments include Distinguished Consulting Faculty of Saybrook University; Research Associate of the Cognitive Sciences Laboratory of the Laboratories for Fundamental Research; Senior Samueli Fellow for Brain, Mind, and Healing of the Samueli Institute; Founder and Research Director of the Mobius laboratory; Director of Research of the Rhine Research Center; and Senior Fellow of the Philosophical Research Society. Government appointments include Special Assistant for Research and Analysis to the Chief of Naval Operations and consultant to the Oceanographer of the Navy. For 40 years Schwartz has been studying the nature of consciousness and its role in social transformation, exceptional human performance, social outcome research, and trends that are affecting the future. He is part of the small group that founded modern remote viewing research and is the principal researcher studying the use of remote viewing in archaeology. He also uses remote viewing to examine the future. Since 1978, he has been asking people to remote view the year 2050, and out of that has come a complex trend analysis. His other areas of experimental study include research into creativity, meditation, and Therapeutic Intent/Healing. He is listed in Who's Who in the World, Who's Who in America, Who's Who in the West, Who's Who in Science and Medicine. The author of more than 130 technical reports and papers, Schwartz has written numerous magazine articles for Smithsonian, OMNI, American History, American Heritage, The Washington Post, and The New York Times, as well as other magazines and newspapers. He has produced and written a number of television documentaries and has written four books: The Secret Vaults of Time, The Alexandria Project, Opening to the Infinite, and his latest, The 8 Laws of Change, winner of the 2016 Nautilus Book Award for Social Change. [How] social transformation can occur without wealth, power, or force. . . . The 8 Laws of Change is a tour de force that will inspire and empower. "Whether you want to be the newest Rosa Parks, a good example for your kids, or just join a group already moving to create change that you want to see in the world. The 8 Laws of Change is worth reading, assimilating, and (dare I say it?) distributing to all."